GoviEx will work with the Government of Niger to rapidly progress the Madaouela uranium project located in the country. 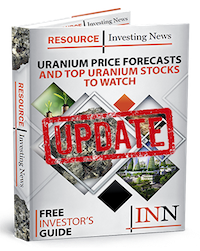 GoviEx Uranium (TSXV:GXU) has announced it will work with the Government of Niger to rapidly progress GoviEx’s flagship Madaouela uranium project located in the country. GoviEx Uranium today announces the receipt of a letter signed by the Honourable Hassan Braze Moussa, Minister of Mines, Republic of Niger supporting a commercial framework reached between GoviEx and the Government of Niger during previously held high-level meetings. The support letter further directs GoviEx and the respective Ministry of Mines representatives to work together to finalize and document these commercial understandings, the intention of which is to rapidly progress GoviEx’s flagship Madaouela uranium project in Niger. The key commercial terms now agreed in principle between the Government and GoviEx will need to be finalised in definitive agreements and remain subject to Government, GoviEx board of directors, and other regulatory approvals. Notwithstanding, a summary of these key terms included in the Support Letter are listed below.